A deliciously light lunch, full of soft sweet flavours, which can also be served with chicken or salmon. 1. Place your halloumi in a really hot griddle pan, and cook each side for a minute or so. The cheese should soften slightly as it cooks. 2. Meanwhile in a separate bowl, mix the ingredients for the dressing. 3. Mix together the rocket, beetroot and figs. 4. Add the dressing and toss until the salad is evenly coated. 5. 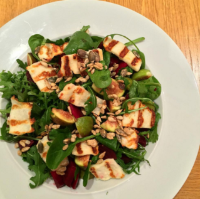 Top with the halloumi and nuts and enjoy!